I saw these images a couple of weeks back and intended to write a post but didn’t find the time due to being away. So here’s a very brief post with some images. 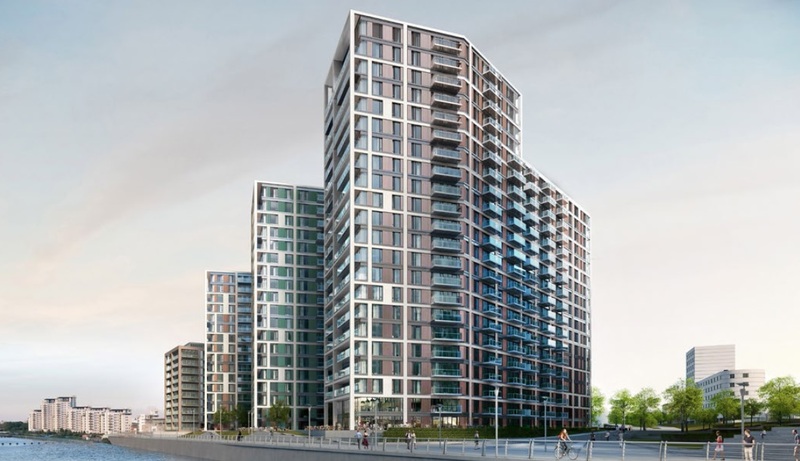 They have probably been reported elsewhere but I thought I’d put them up to show the plans for the tall buildings next to the Thames, being built by Berkeley Homes as part of their Royal Arsenal development. The towers are reasonably tall, but I think they should be taller. Not a particularly popular opinion I’m sure. The tower closest in the above image looks too squat with the tall, slab like appendage to the right. A well designed, elegant tall building is always better than one compromised and squashed down to meet height limits, which are often arbitrary, and. In place of elegance and grace comes squat and stumpy lumps. The attached wedges are more intrusive and ugly. There’s a sense here of this happening. If the closest tower were 5-10 storeys taller it would be a better centre piece to the area, and the slightly shorter attached slab-like part of the building to the right could be reduced by 5 storeys. The image on the left shows the slab to the rear of the tower. reduce that by a third at least to prevent it’s overbearing mass and add it to the tower. This faces onto a park so will have a greater impact than the slabs to the right, though they could do with a reduction too. The material used is terracotta panels. It’s like heading back 10 years when terracotta panels seemed to adorn most new builds. Before swiftly being ditched. Berekley have generally done a very good job with the Arsenal development. Many of the brick blocks are top notch. It’s a shame they have devaited from that to this dated, squat collection of buildings. 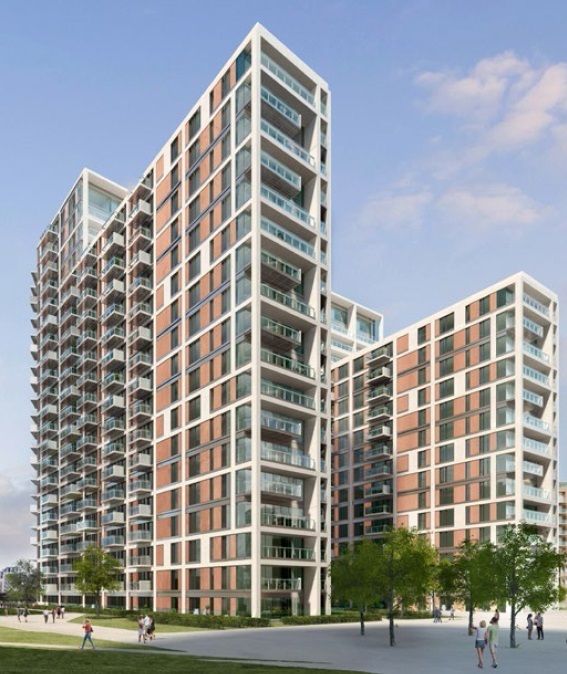 One grim example of a terracotta clad, overbearing residential building attempting to squeeze as many units as possible ‘New Providence Wharf’, seen above, which faces onto the Thames a couple of miles upstream. The Berkeley towers are not as bad as that, but many of the same mistakes and compromises are evident. The site is however is an ideal spot for a tower. Located close to a major new transport system in Crossrail, which is designed for high capacity, high frequency services to major centres of employment. It is also close to river services, the DLR and Southeastern trains. River services and southeastern have large scope for capacity increases in coming years. So a suitable spot to build tall. With the lamentable levels of house building since the 1990s under all shades of government and high levels of population growth there needs to be a massive increase in building, and towers, if well designed, can do a great job. Of course there are many issues with levels of ‘affordable’ housing, and foreign investors buying up many new builds and then leaving them empty, or avoiding tax by registering through companies, or letting them out at market rates so high people can only afford it by claiming housing benefit costing taxpayers a huge sum. But these issues do not negate the benefits of building tall. High density is needed. 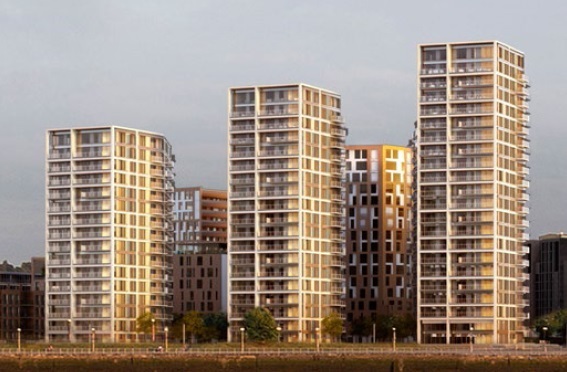 These towers will be joined by the tower proposed over the road by Riverside House as featured in my last post. Greenwich council have also confirmed they will move Waterfront Leisure Centre to a site occupied by Wilkinson’s in General Gordon Square in the town centre, and the leisure centre site will see more towers. There’s real scope there to open up the river and access to Hare Street and shops, as existed decades ago, and to bring the foot tunnel into the open. Finally, below is how the Berkeley towers will appear from the river. Nice enough, with clean and clearly defined lines, with the rear slabs not visible. You don’t take into account the fact that we live in a water scarce area – the recent rain is likely to be matched with dry summers – nor the problems with sewerage. Then, increased densification brings increased air pollution, both through transport and heating. Building towers by transport interchanges should mean less private transport usage and congestion as people will have ample public transport within walking distance, and not just very slow buses. The alternative is to extend sprawl into the suburbs increasing private car reliance. Another option is to not build sufficient housing, but the population is rising pretty rapidly. People need places to live and house building levels have been atrocious for the past 20 + years. We can leave the young, and all those who didn’t buy before the late 90’s, to very expensive rents and house prices but it’s hardly fair and good for quality of life, or wider society, as wealth is hoarded by older generations. Nor does it help the economy to have people forced to live miles out and suffering long, expensive commutes. Companies will also have to pay staff higher wages for living costs decreasing the competitiveness of London and the UK. Taxpayers also have to pay far more to top up housing costs. There are of course many other factors involved – lack of council/social homes, land banking, unoccupied homes as bought as assets etc. I went to the display of plans etc in the Royal Arsenal recently. Whilst speaking to one of the representatives I explained how I thought the design was uninspiring and poorly thought out. If you are going to build big, build interesting. I believe that the close nature of the building and their orientation will lead to little or no light in the majority of properties. My views were not shared by the woman I was talking to who turned out to be the architect. I stand by my comments.